When he’s not streaking through the Danger Zone on an Impossible Mission, the world’s biggest movie star (yes, still arguably) veers Far and Away from his core competency, occasionally taking a mega-risk with his Eyes Wide Shut. Corniness of that opening sentence aside, Tom Cruise makes for a compelling model of how to run a brand: while his trademark relates to an über-successful motion picture career – and yours (likely) doesn’t – there are many things a business can learn about reputation management and content strategy from him. And just what is the “content strategy” of Tom Cruise’s career? It’s fairly simple. Mr. Cruise delivers to his core audience while attracting new fans with moderately risky creative choices, still keeping himself fresh for critics and colleagues with strategic, iconoclastic roles that challenge the core Cruise brand. 70% of our content should be solid, standard stuff: Basic how-tos and advice that’s very safe and is easily justified as supporting SEO and other efforts. 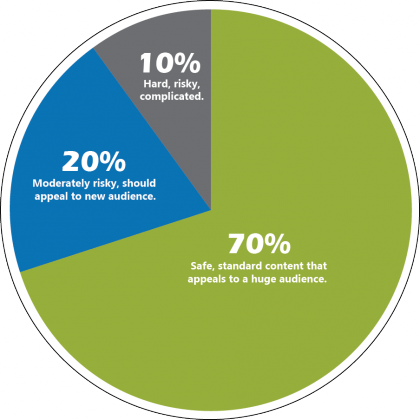 20% of our content should riff on the 70%, but take some chances. This is the content that expands on 70% content, but may flirt with controversy, or try appealing to a new audience, or otherwise be moderately risky. It may also take a bit more effort. It also offers a higher potential payoff. 10% of our content should be completely innovative: Things we’ve never done that, if they work, could become part of the 20 or 70%. 10% content often requires a lot of work or audience interaction. Or, it’s just risky. Most of the 10% will fail. You still have to do it. It’s really important, because without it, the entire strategy stagnates. 70% of his roles represent The Movie Star. The Tom Cruise™ brand: That cocky, loveable scoundrel who is exciting and risky, but inevitably on the side of right. These Cruise personas – Maverick in “Top Gun,” Ethan Hunt in “Mission: Impossible” – often have tragic backstories that enable us to look past their initial conceit, waiting for a denouement which always proves the Cruise character to be heroic, self-sacrificing and truly good. 20% of his roles represent The Actor. Tom is still Tom – generally looks like him, sounds like him, acts like him – but he’s taking a chance. Maybe it’s a period film like “The Last Samurai,” or working in an unfamiliar genre like “Minority Report” or spending half the movie in a mask (“Vanilla Sky”). Tom does these films both to challenge himself AND to increase his “brand reach” to various demographics who may find his 70% films cloying or predictable. 10% of his roles represent The Iconoclast. Tom isn’t Tom. In fact, Tom is trying to tear down Tom Cruise™. Here’s where the “art” happens. He takes big risks like ranting about his manhood in “Born on the Fourth of July,” or playing a misogynistic, manipulative motivational speaker in “Magnolia.” Both of those films landed him Oscar nominations. There is a HUGE upside to 10% content, but the downside is just as large. This also is where you can fall on your face (see “Eyes Wide Shut” and “Rock of Ages”… on second thought, don’t). 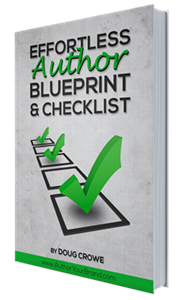 Deliver basics to your core audience & attract new fans with moderately controversial content.